1828 map of Mexico and the future Southwest U.S. Hall, Sidney. 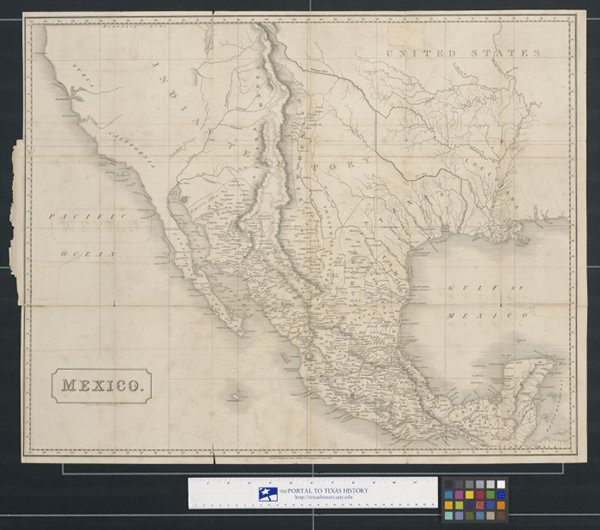 Mexico., Map, 1828; (http://texashistory.unt.edu/ark:/67531/metapth251745/ : accessed October 22, 2015), University of North Texas Libraries, The Portal to Texas History, http://texashistory.unt.edu; crediting University of Texas at Arlington Library, Arlington, Texas. Do you research Hispanic genealogy or history? Do you teach U.S. or Latin American history? Are you a librarian who serves Hispanic communities? Next week’s Family History Conference–hosted by the Texas State Genealogical Society–is packed with a great program in general, but provides five sessions that focus specifically upon Hispanic genealogy and history. 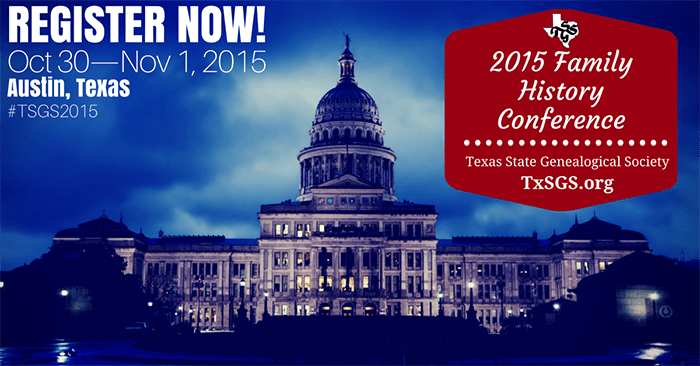 This two-and-a-half-day conference takes place Friday, October 30, 2015 – Sunday, November 1, 2015 in Austin, Texas. Use coupon code family20 to get $20 off the $150 fee of the full 3-day registration. Use coupon code family10 to get $10 off any single-day registrations. Register now, on the #TSGS2015 site! I am usually pleased to find just one or two sessions focusing on Hispanic genealogy and history at conferences, but this conference features FIVE breakout sessions that are of high value to those researching or teaching Hispanic history. (1:45pm – 2:45pm) Colleen Greene, Portals to the Past: Helping Patrons Find & Use Southwest Archival Collections: I blogged details about this session last month. While the class discusses archival collections pertaining to all eras and geographic areas of the American Southwest, much of this will focus on collections relevant to the Spanish colonial and Mexican-rule eras of the Southwest U.S., as well as southwest immigration and current southwest populations. Saturday is the official Hispanic Track, and there are three consecutive breakout sessions. (1:00pm – 2:00pm) Colleen Greene, An Introduction to Researching Your Mexican Ancestors: I discussed this session last month as well. We will cover three basic Mexico record types, as well as key U.S. record types for tracing your Mexican ancestry. (2:30pm – 3:30pm) Dr. José Barragán, The GLO Spanish Collection as a Genealogical Resource: Dr. Barragán is with the Texas General Land Office Archives, and will discuss the Spanish and Mexican land title records granted in what is now Texas, prior to 1836. (4:00pm – 5:00pm) Henrietta Martinez Christmas, Solving Complex Hispanic Research Challenges: Henrietta is the current president of the New Mexico Genealogical Society and a frequent speaker on Hispanic genealogy. I am looking forward to learning more advanced methodology from this session. (2:30pm – 3:30pm) Henrietta Martinez Christmas, Land Grants in the Hispanic Southwest: Spanish and Mexican-era land grants in the extended Southwest are of particular interest to me, since my father’s family has long-time ties in present day New Mexico, and because of my research on the Manuel Nieto land grant in California. I look forward to seeing you in Austin next week!